Athena's Armory / Learn / Fundamentals / When Is Deadly Force Justified? There have been a few attempted kidnappings in our area lately and I have had people have asked me if they are justified in drawing a firearm to protect themselves or other persons from being kidnapped? First, recognize that the details of every situation are different and there are many variances in the law depending on where you live so check your local laws and realize that this article is not legal advice! For those of us who live in Florida, however, the answer is yes – kidnapping is considered a forcible felony and meets the standard for the use of deadly force to protect yourself or another person. You may not use a firearm just because someone threatens to kidnap you or if they look sideways at you from across the aisle in a parking lot. There are preconditions that must be met for the use of deadly force. Responsibly armed citizens want to keep the gun in the holster as much as possible and can use a variety of tactics to reduce the chance of needing a firearm at all. Always keep your head “on a swivel” and be aware of who is around you and what you they are doing. Present yourself as a hard target by making eye contact and letting everyone know you are aware of what is happening around you. Carry a pepper spray in your hand and/or call out suspicious persons right away. Move to areas that have more light and more people to help provide safety and know where your exits are at all times. Sometimes life happens too fast and we are presented with an ugly situation. Unfortunately, if you are ever in the position of having to use deadly force to defend yourself or another person, you should first understand that your battle will not end when the police arrive. In fact, your legal battle will be just beginning, even if it was a clear case of self-defense. How does the legal system decide when deadly force was justified? Of course, every case is different and this quick review should not be taken as legal advice in any way. However, you can (and should) be familiar with what is known as the Reasonable Man Doctrine. The Reasonable Man Doctrine is the baseline standard against which your actions will be measured. 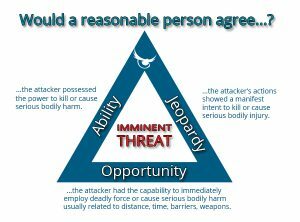 The doctrine asks, “Would a reasonable person under the same circumstances, knowing what you knew at the time, likely have used deadly force in self-defense?” The answer revolves around three core elements: Ability, Opportunity, and Jeopardy. Did the attacker have the power or ability to cause you grievous bodily harm or death, or more simply – did the attacker have a weapon? Usually, this is pretty clear cut. What if an attacker, or multiple attackers, are kicking, punching, or choking you? In this instance, you will need to show that it was reasonable to believe that your attacker(s) had the ability to cause death or serious physical injury. One high-profile example of this type of situation was the Zimmerman case right here in Florida. The second part of the reasonable man doctrine is opportunity. 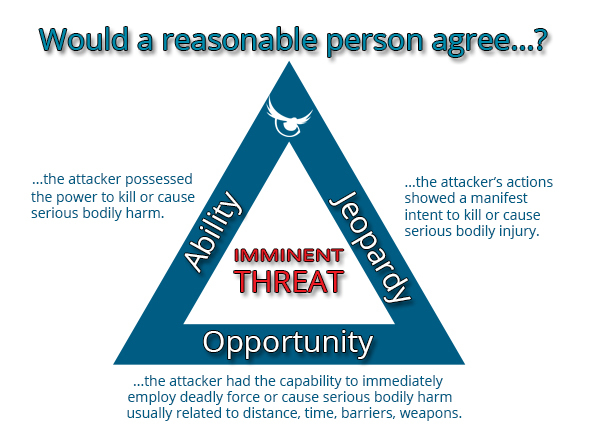 If the attacker had the ability to cause death or serious injury, did he or she have the opportunity? Usually, this revolves around the physical proximity of attacker and defender and depends upon the type(s) of weapons involved. A scary looking guy with a baseball bat (ability) may threaten to kill you as he yells up to your hotel balcony 4 floors up, but that doesn’t mean he has the opportunity (at least at this instant) to kill you. You would not be justified in firing on the man below you. An attacker with a firearm may be a different story. The final element of what is meant by “reasonable” is the element of jeopardy. Even if both other elements, ability and opportunity, are present in a self-defense situation, you must still prove that the attacker was intending to carry out an attack, as manifested by his or her actions and words. Was the person yelling at you with a weapon in hand? Was the person threatening to cause grievous bodily harm or death? A stranger could round a corner at you with baseball bat in hand and simply be making a wrong turn in your direction rather than toward the ball field. You might see someone unpacking firearms from their trunk after a range day, but obviously they are not a threat to you at the moment. As you can see, the details of the case are extremely important and there is a lot of gray area in many cases. There can be a fine line between justifiable self-defense and manslaughter. Fortunately, if you have read this far, you are from a on your way to understanding when deadly force is justified. Knowing these and other general principles, and knowing your specific local laws will help you maintain your status as a responsible gun owner. If you are interested in learning more about the legalities of self-defense, please check out the Armed Citizens Legal Defense Network. The network and its educational foundation provide a ton of valuable information and services to members, including a network of attorneys that are available to help in the event you are involved in a self-defense incident.